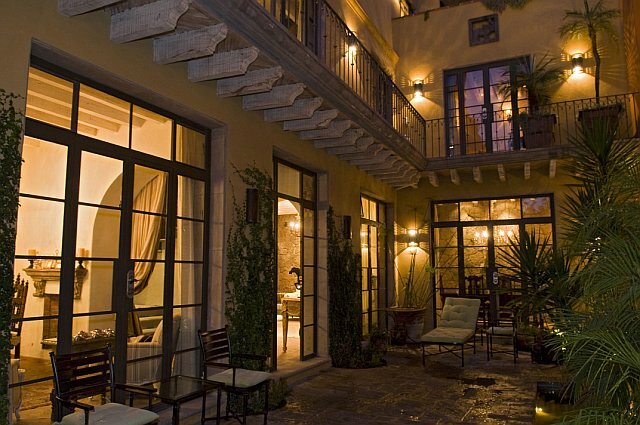 The sophisticated traveler to San Miguel will find a welcome luxury hideaway at the lovely Casa del Pasajero, located in the heart of the Centro Historico, a veritable oasis just steps away from the main square, el Jardin. 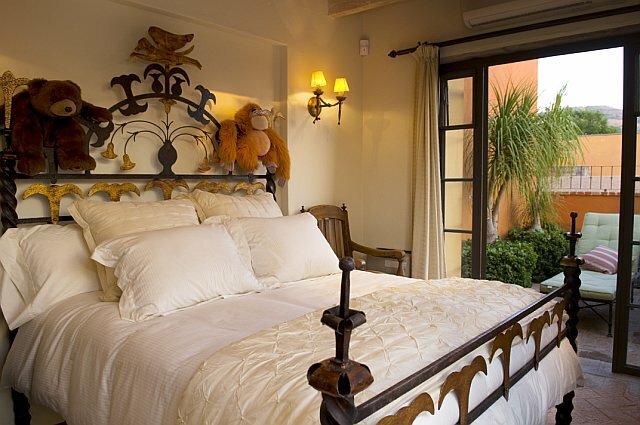 This 3-bedroom, 4.5-bathroom villa is the perfect place to come home to following a day of art/language classes or after sightseeing in this charming colonial town. Relax and be pampered by the English-speaking maid who is waiting to serve you. 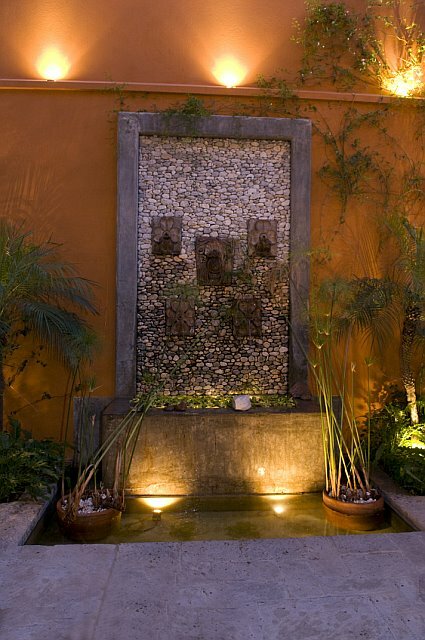 Enjoy one of her home-cooked meals in the lush interior patio with waterwall fountain and adjoining open-air sala. 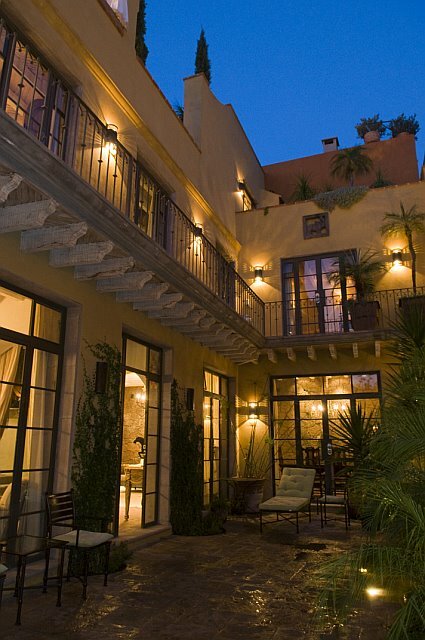 Savor your evening margaritas on the roof terrace, enjoying the sunset and magical glow of twilight as evening falls over the town. 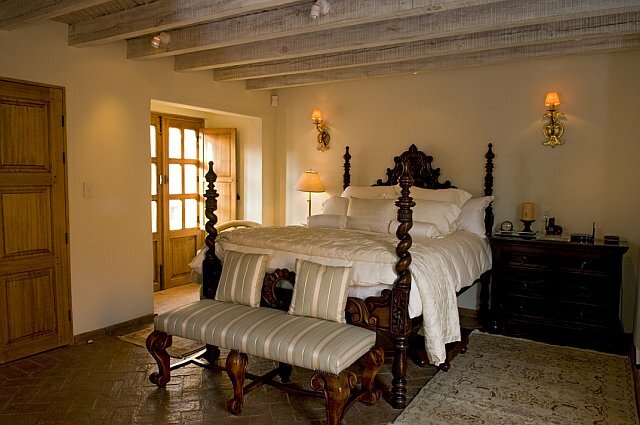 Newly renovated and elegantly furnished with the owner's caring and artistic touch, Casa del Pasajero is perfect for two or three couples, as the bedrooms all have queen beds and are well separated from each other with their own sitting areas, en-suite bathrooms and indoor/outdoor access. Bedding and bathroom linens are soft and plush, all of the best quality. 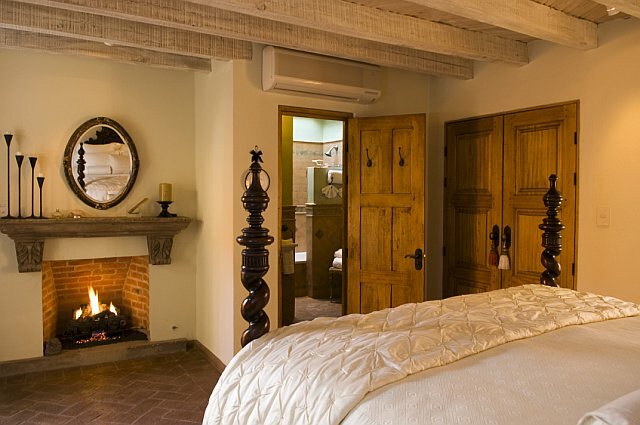 Each bedroom suite is enhanced by a stone-carved fireplace and supplemented by top quality gas heaters to keep you cozy on cool winter evenings. 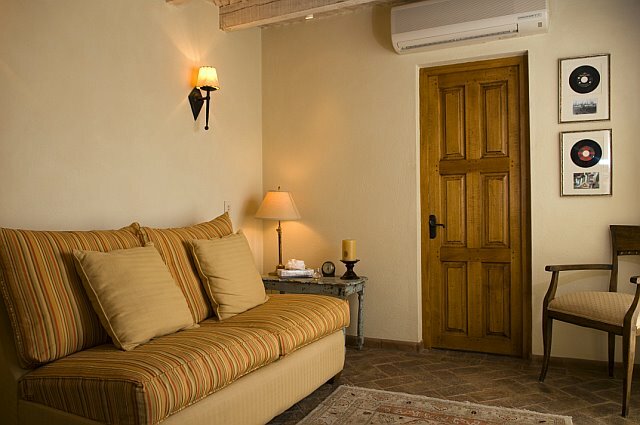 Air-conditioning units and ceiling fans add to your comfort when the weather gets warmer. 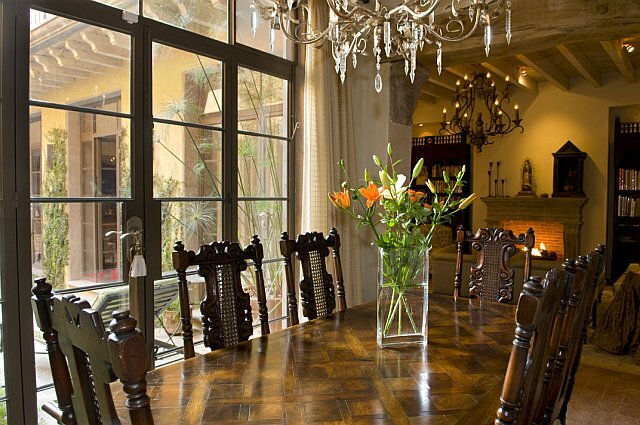 To welcome you, the owners leave a bouquet of gladiolas at the start of each rental. 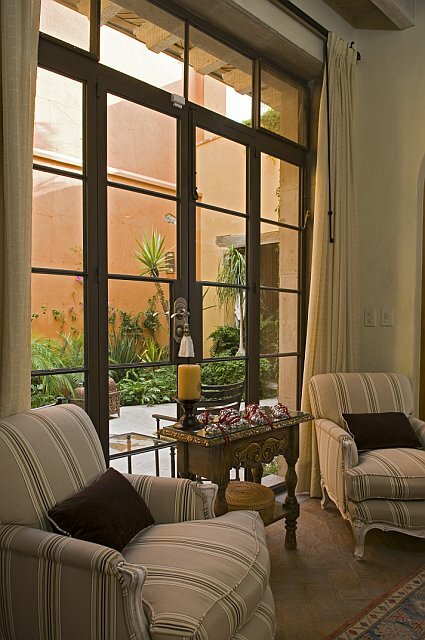 You will be greeted by a representative from San Miguel House Rentals when you first arrive, who can show you through the house and explain how everything works. 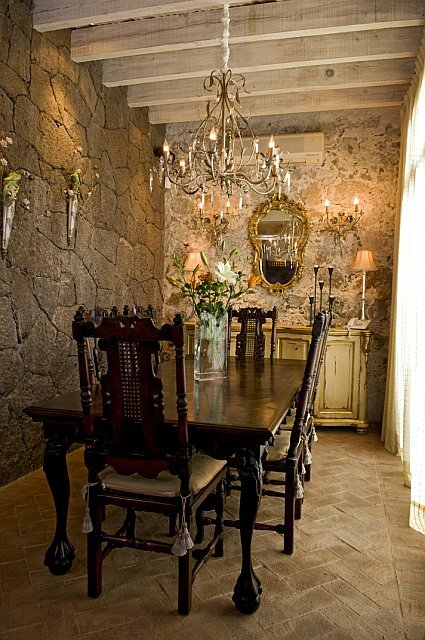 PLEASE NOTE: Casa del Pasajero has two price structures, depending on the number of renters and bedrooms used. 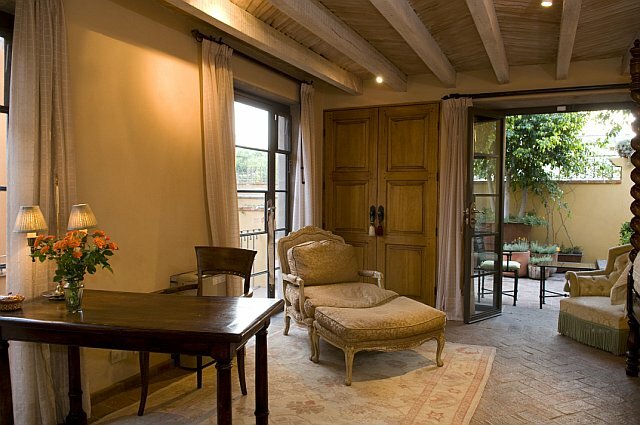 Internet service is gratis via high-speed cable connection for your own laptop, which you can set up in a sitting room adjacent to one of the guest bedrooms. There is also a Mac desktop computer and printer available for renters’ use. The house is wired with a surround-sound stereo system. 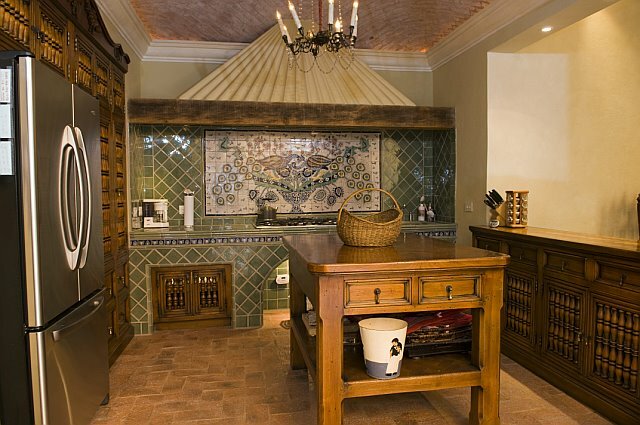 Casa del Pasajero also has whole-house water purification that features a water softener and special water pressure system. 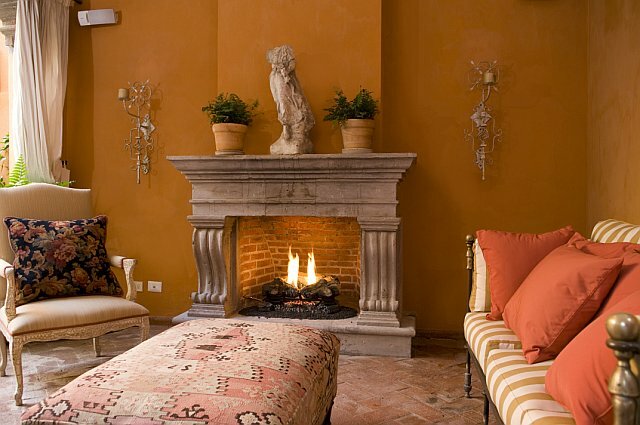 These modern luxuries are in balance with the house’s antique yet comfortable style, surrounding you in the pleasures of San Miguel living complemented by every modern convenience. 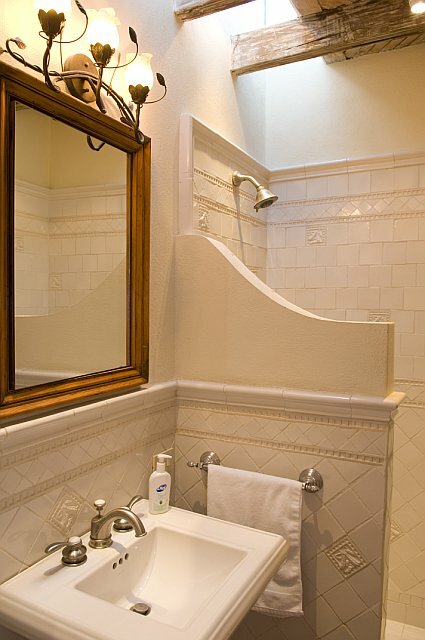 You will relish the quality details of the house, including custom stone and tile work by local artisans, wood-beamed ceilings in all the bedrooms, fine furnishings and artwork throughout, and a covered rooftop sitting area, complete with wet bar. 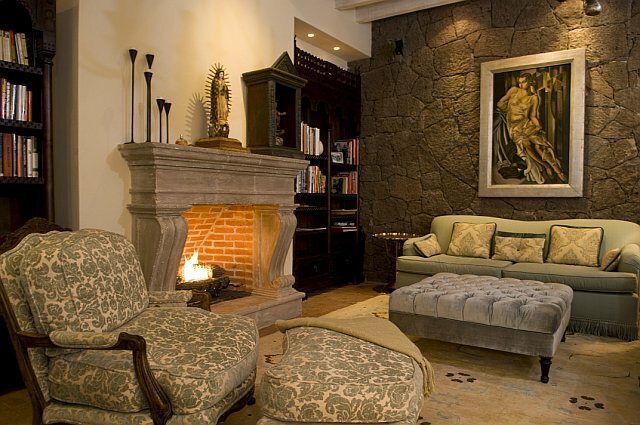 A total of five stone fireplaces create a warm and inviting atmosphere. There are three roof terraces on different levels. 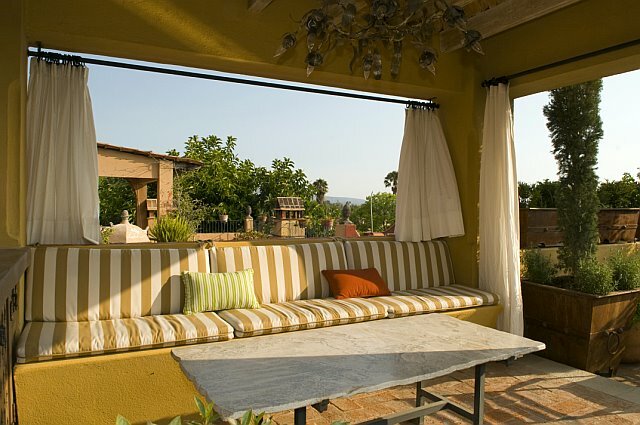 The first roof terrace off the master bedroom has an outdoor Jacuzzi and seating. 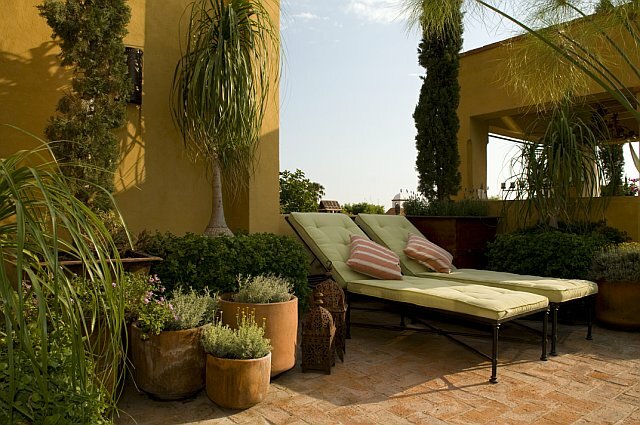 The main roof terrace, up on the third level of the house, is graced by potted trees and flowers, creating another lush outdoor setting for indoor/outdoor living. From here, you have a picture-postcard view of the Parroquia church. A third, private terrace with lounge chairs is off the bedroom on this upper level. Mimi the maid comes Mon-Fri from 9 am to 4 pm and also on Sat mornings (9 am to noon) to clean and to cook for you. Laundry and ironing services are provided once a week. Six days a week, she can prepare your breakfast (delicious huevos rancheros, or other egg dishes, plus fresh-squeezed orange juice). 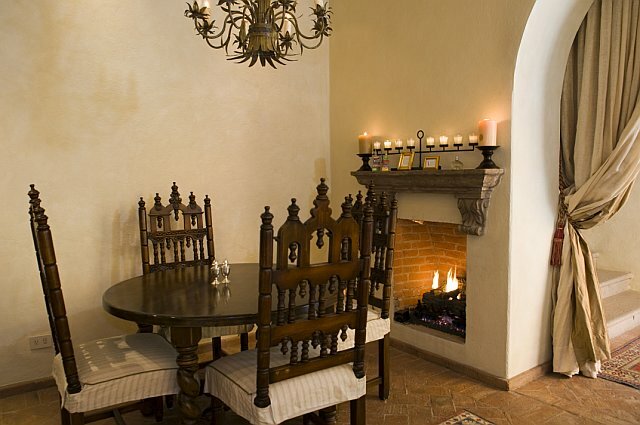 Or sample her enchiladas verdes for your mid-day comida and enjoy the service of home-cooked meals. The actual food costs extra, depending on what you want to eat. We provide a food/beverage stocking service if you want supplies brought in prior to your arrival, and then Mimi can shop extra for any fresh supplies you might need. Mimi also is available for extra hire for a special evening meal or to stay later, with advance notice, if you want her to return after her regular hours of 9 am to 4 pm. Jose the gardener also speaks English and comes 3x weekly to tend to the garden areas and the many potted plants. Jose is knowledgeable about the TV and air-conditioning units, fireplaces and all house systems, so you can ask him any questions about those things. 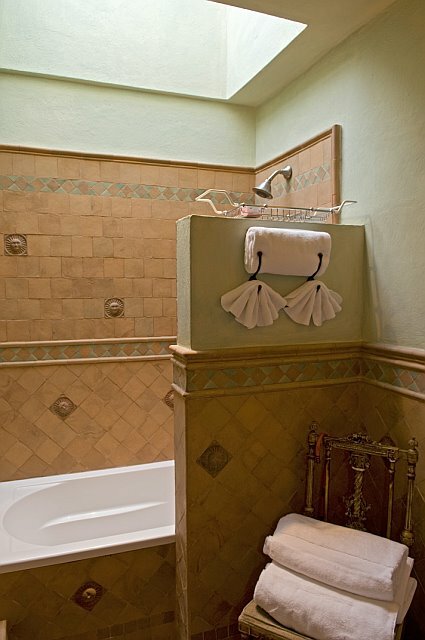 He also cares for the outdoor Jacuzzi on the terrace off the master bedroom suite. 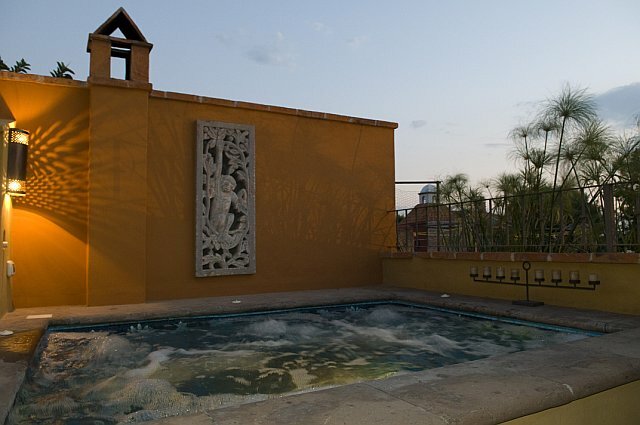 This over-sized Jacuzzi is normally kept at a natural dipping-pool temperature, but it can also be heated up, if you so desire, for a propane gas fee of $150 USD/week. Please let us know in advance if you want the Jacuzzi heated. 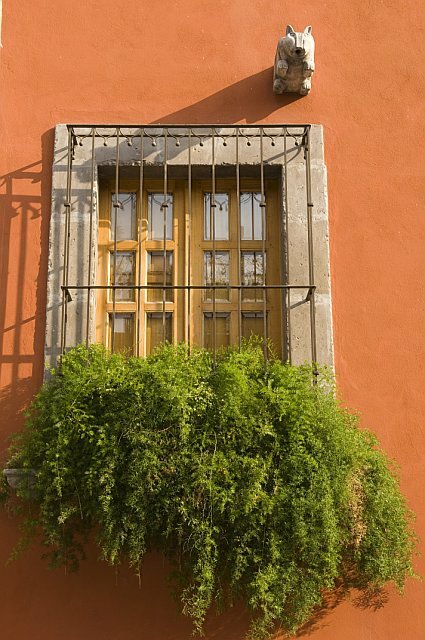 The owners respect the guidelines of San Miguel Verde (“Green San Miguel”) and request that renters also not use heat, water and electricity unnecessarily. 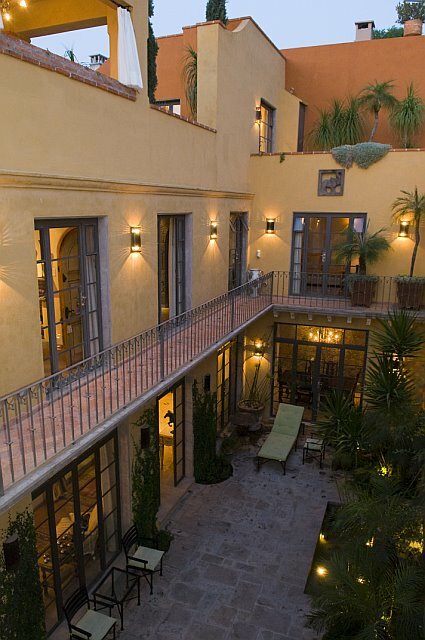 Once in town, you will appreciate the great Centro location of Casa del Pasajero, making it easy to walk to all the fine restaurants, shops and galleries, and just minutes away from the Jardin and the city’s landmark La Parroquia church, the heart and soul of San Miguel. 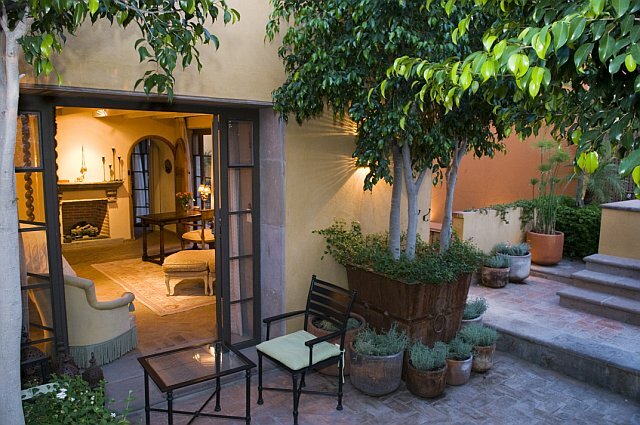 No need to bother with a car here, as you will settle into the wonderful lifestyle of old Mexico, watching the sunset from your roof terrace while you relax in the Jacuzzi, or strolling to small neighborhood tiendas to buy fresh tortillas or to the nearby Parque Juarez to enjoy a Sunday afternoon band concert in the gazebo. At night, you will be in awe of the picture-perfect postcard view of the beautifully lit Parroquia church spire from your roof terrace, or you can simply gaze up at the starry evening sky. 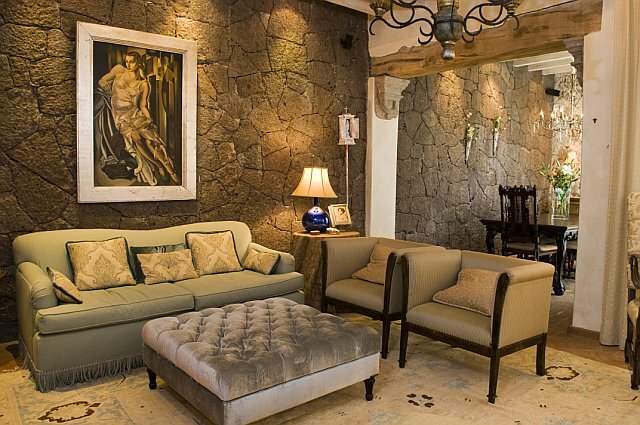 In all, a perfect place for your San Miguel vacation! 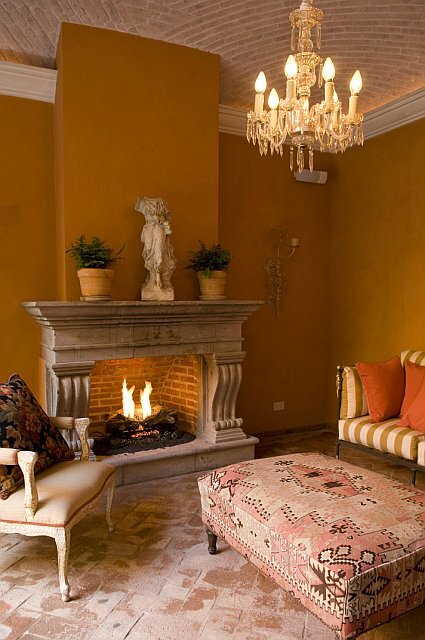 NOTE: Casa del Pasajero has two price structures, depending on the number of renters and bedrooms used.